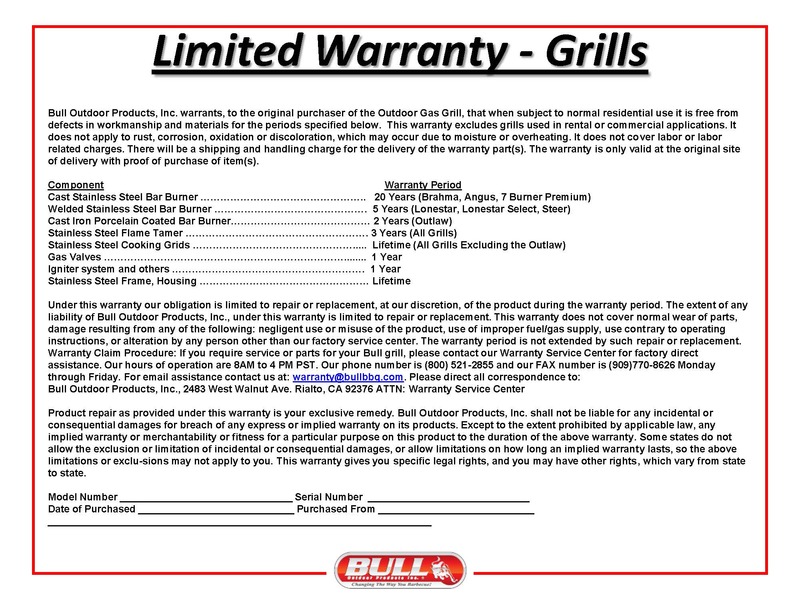 You can obtain more information about the 30" Bull Lonestar "Select" on a Cart from the Gas Grill Warehouse store by Email gasgrillwh@aol.com or call (281)894-8878. 30" Bull Lonestar "Select" on a Cartis just one of the many outdoor Kitchen Products available on the Gas Grill Warehouse web site. The Bull Lonestar Select is a premium 30" four burner stainless steel grill on a cart. A twin lighting system, makes cooking at night much easier. The cart includes two shelves and double doors that provide access to storage beneath the grill It is available in natural gas or propane. The Commercial-Style Griddle on a cart is the newest addition to Bull's line of outdoor kitchen components. It is constructed of 304 grade stainless steel. Three stainless steel burners, under a chromium-plated griddle produce 45,000 BTU’s of power. The griddle expands the variety of foods that can be prepared in your outdoor kitchen. Its durable construction ensures many years of enjoyment. The stainless steel cart provides storage space below, with two side shelves for plenty of food preparation space. It is available in natural gas or propane.